The latest iOS 8 issue to catch everyone’s attention is the ‘GMT Bug’ in Calendar app which seems to be messing up time zones of synced calendar events, where said events added by users are often springing up with a secondary time zone. More on this news, right after the jump. Discovered by Forbes in the Apple Support Communities, the thread hosting the perils of users experiencing this frustrating issue has been around for over four months, with nearly 600 replies and 220,000 views. Aptly dubbed the ‘GMT Bug,’ this annoying little glitch is big on trouble. How? As a user creates an appointment or event on an iPhone or iPad, the device will automatically obtain the time zone settings of the clock on the server where the user’s account is currently residing. In most cases, the appointments are being moved to the GMT time zone. This is a pretty serious issue for business owners and office goers, and is forcing people to move onto third-party calendar apps. Apparently, the most issues being reported are coming in for appointments originating from Google or Microsoft Exchange accounts which have been linked to the native Calendar app in iOS. If it helps, the time for the events set does remain correct for the user so it is unlikely that it would be missed. However, the trouble arises when the user decides to edit the entry with no knowledge of the time belonging to a different zone. This right there is the serious concern. Some users received a response from Apple Support representatives saying, “This is expected behavior with iOS 8”, which is of course ludicrous, but four months later, the Cupertino giant has acknowledged the issue and has said that it is working on a fix. There’s a high chance that iOS 8.1.3 would be that fix, but who knows. iOS 8 is the biggest (literally) release of Apple’s mobile OS ever with an ecosystem which has been slightly opened up for third-party integration. However, the release has also been one of the buggiest in Apple’s history, bringing in issues ranging from broken Wi-Fi, Bluetooth, battery drain, more, and compelling the company to release a rush of updates in a span of over three to four months. Do let us know if you have encountered the ‘GMT Bug’ on your iOS device at any point. Sound off in the comments section below. It would be nice if Apple would hurry up and release iOS 8.1.3 already. Here’s the workaround – go to Settings – Calendar – Overwrite Timezone, and put there whatever is the zone you’re in. I wish there was a simple workaround such as described by the other commenters. Unfortunately, these don’t work for most people. In most cases they also don’t work for the people who claim they found the magic-bullet fix. In most cases, if you check back after a little while, once your device resents with your hosted calendar, the GMT thing will be back. Most people don’t come back to post and let everyone know their miracle fix turns out not to be a fix after all. It’s possible these suggested fixes do work in some isolated cases, but unfortunately they won;t work for everyone. Tried it. Doesn’t work in my case. Tried it. Doesn’t work in my case. In fact, on my devices, the Time Zone Override function doesn’t do anything…it’s just a little graphical switch you can flick back and forth. In fact the Time Zone Override feature is not even documented in the “official” iOS 8 user manual that Apple provides to IT Managers. I do think that this feature is linked to the GMT bug in some way though…. App sync bug within timeframe leaves heavy traffic of disatisfaction in the minds of users of its services. A dropdown increases in loyalty . You need to choose the time zone under the switch. My problem was that when I created a new event, it was shifted by 1 hour automatically. Calendar app shown the event with the entered times but for GMT zone, as if the device did not know the zone I was currently in. Hence the events were actually shifted in time. When I set my time zone in that settings and restarted Calendar app, it no longer shown GMT time but my zone time. It however did not move already created events, this I had to do manually. Any event created after the settings change was created correctly. No more issue for me. I use and sync many calendars with Google, never happened since then. It is even written in the settings description what it does, and this is exactly it. I even checked my other settings for you. In General – date and Time, the time zone is not loaded and it says Location services must be enabled. Then I went to Location services – System services – Time zone and indeed, it is disabled. I think I had disabled it when I installed iOS8 in order to preserve battery life. Do not intend to change though, it as then things now work as they should for me. Thanks for re-checking. Unfortunately this really does not work for most people. I tried it myself. I know about the additional setting. I purposefully set it to something in Asia so that it would generate a huge change on my calendar events. But it doesn’t change anything in my case. If you go and read through the Apple Support Communities thread, you will see different people claim that this particular solution (and others) is “THE FIX” every couple weeks. Then you will see their posts followed up by posts of several other participants who tried it and are reporting back that it didn’t work. I am glad that for whatever reason, this worked in your case. But don’t you agree that if the solution was really as simple as just changing a setting, Apple would tell people that, and there wouldn’t be nearly a quarter of a million views of the support thread about it, which itself has about 600 posts? The only people who can fix this work in the Apple engineering department. We have to wait for them to get off the stick. I’ve had the issue for several months with multiple Google accounts. 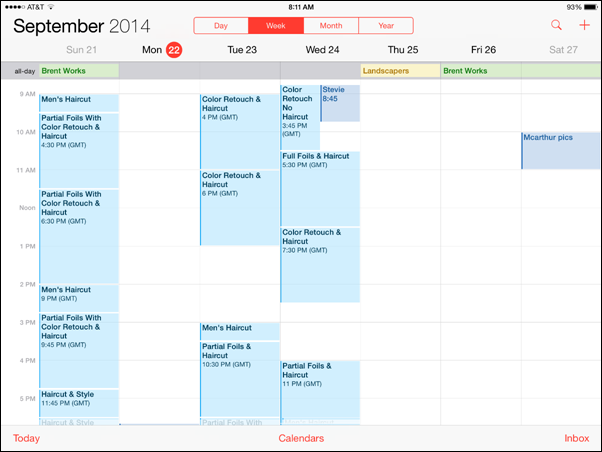 No issue with iCloud calendars. It’s annoying! I expect more from Apple. I can’t believe no one caught this during testing pre-release of iOS8. FYI this bug did not mak its first appearance in iOS 8, it has actually been around even on iOS 6 and 7. Although now that its been publicized, maybe apple will finally notice and fix it. no one caught Jony Ive the idiot while he was crappifying and shittifying iOS 7. I enter a 1pm appt on my iPhone or iPad (doesn’t happen on my pc), after one to two seconds the calendar item suddenly shows gmt time on the item, gmt 9pm right under the item title, even tho the item is placed in the 1pm slot. When I go back in to edit it, it switches the item to the 9pm slot! I have to edit it back to 1pm and switch the time zone to California time to keep it there. Ever single appointment. Very annoying and time consuming. My settings are correct, for pacific time, and this just stated happening spontaneously after one of their updates, I had changed no settings. The item starts out correct and then spontaneously changes out of nowhere a few seconds after its placed. Iphone is showing the calendar date as 5885 BE or same crab. This is a very annoying problem! Apple needs to address this issue now!! My experience exactly as Frustrated stated. 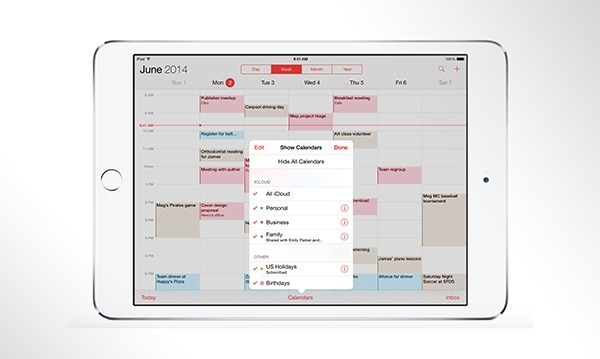 Very upsetting – iPad calendars in CST, although time settings are for EST – New York. Must remember not to enter appointments on iPad or enter them in a differenet time zone. YES, have had this problem ever since moving to IOS 8 (am syncing with my Google Calendars). I hope that Apple is taking this seriously, as it is driving me nuts! I do a lot of my additions & edits on my iPhone or iPad when I’m out and about so this is a big problem. Yes, I am having the issue with GMT in my calendar. It’s super annoying! I am getting reminders hours before or after my expected scheduled event. Apple, get your shiz together and fix this!! Do I have to go back to writing reminders on my hand? Pffft. Have had this problem only since leaving CST, going to MST, then returning to CDT. Does not seem fixable and most appointments are now listed for both CDT and MST. Bizarre!! Problems still not solved in iOS8.3. I use Exchange ActiveSync in my company. An entry of 10:00AM CEST in the Amsterdam time zone shows up later as 4:00AM GMT-4h in the New York time zone, while editing. Still the same moment, but very annoying and confusing. I concur with John: iOS 8.3 still did not address this annoying issue! I fixed it by logging to gmail, adwords, google calendar, with my non-gmail email address. If you have ever used you primary(non gmail email address with a google product, it will also have a calendar. So, login using non gmail address, for me it was my work provided account, which is my main email on my iPhone. Use that address and log into google calendar and check the timezone. Mine was set to something other than my normal eastern time. This finally fixed the problem. Sound weird, but some how google would see that the email were going to my workemail and it added the timezone info before they were set up. My company does have some corporate google apps linked to out active directory, so this could be also part of the problem. Good Luck. I am having the same as dude since creating a personal outlook account however the outlook time zone is set to New York and so is the time zone in the iphone 6S but it doesn’t seem to matter every event is on Cupertino time. Very frustrating. The problem is code. Apple and Google perhaps Microsoft as well do not use the same coding for their tzid. Should they one day sit around the table and just make one unified tzid all of these issues would disappear. STILL having this issue and am completely updated!